I pinned this a long time ago, when I first discovered Pinterest. I have been wanting to make it FOREVER. 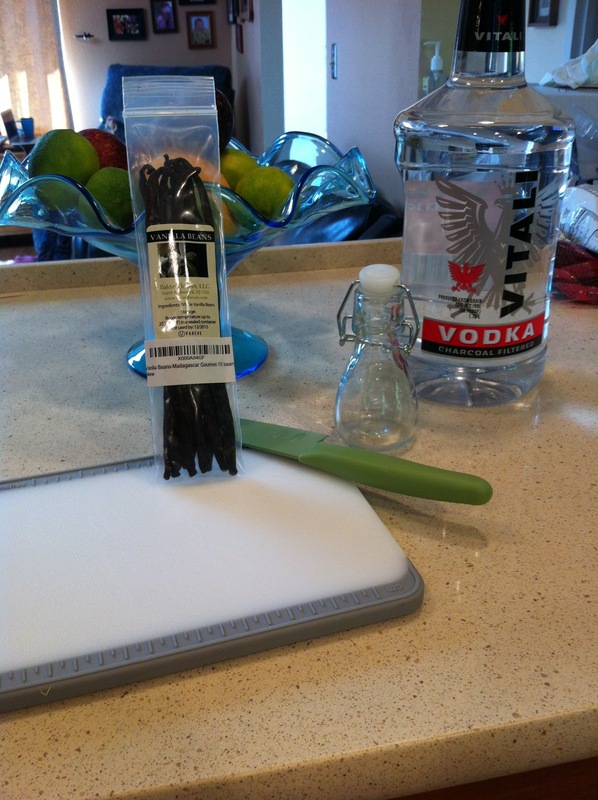 But obtaining whole vanilla beans, is kinda hard. I couldn't find a store locally that sold them. I looked on Amazon but wasn't sure I wanted to spend $12 for 10 beans. And by the time I talked myself into ordering from a co-op, it was closed. So I started first by finding the jar I wanted. I went to Michael's, Joanne's and finally I stopped in at a Hobby Lobby, which is where I found the jar I liked most. Then I was ready to buy my beans. Since the co-op was closed, I went ahead and got them from Amazon. Best smelling mail ever. I did some research on what type of vodka to buy, and I didn't find anything that said top shelf was better, so Matt picked out this huge bottle (for my 5 oz jar). Then all of a sudden, I had all my supplies. 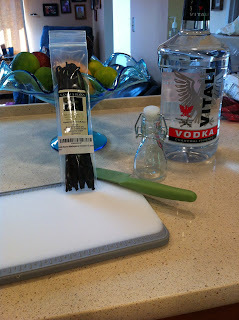 Then I did what any normal person would do, I cut up my beans, put them in my jar and topped it off with vodka. I shook it a little, and put it on the top shelf of my spice cabinet. I cannot wait to use my homemade extract, however it won't be ready for up to 6 months. I am so excited about this, that when I found out the co-op was having ANOTHER vanilla sale, I signed up for more beans. I might put together a bunch of these and give them away as gifts for Christmas. 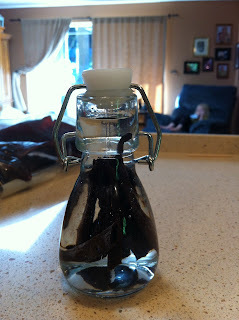 But I am also very excited to use my vanilla beans in a ton of different ways. For instance, did you know you could use vanilla bean pods (the part left over after you scrap your seeds out to cook with) in a shaker of baking soda and use it as a carpet freshener? You can also boil it with other spices to make for a very tasty room "potpourri." All of these ideas I am going to do when I get my larger supply of beans. Oh and in that co-op, I am also getting whole nutmegs. Baking this fall is going to be INSANE! I currently have 2L of vanilla brewing in my pantry with my beans from the first co-op. It's gonna make some great smelling Christmas gifts. Man I wish I had picked up some vanilla. This is such a good idea!